During winter, common gulls feed mainly on earthworms; they are often attracted to recently ploughed fields for this reason (7). At other times of the year they will also feeds on insects, fish, small mammals, carrion and rubbish (3) (6). They are often attracted to rubbish dumps in harsh winter weather (6). The nest is built on the ground, on boulders, in low trees or on buildings, typically near water (2). Occasionally common gulls nest in groups with herring gulls, but they may also nest alone (6). Pairs produce between two and five eggs, which are incubated for up to 28 days. The chicks are fully fledged after a further 35 days (3). 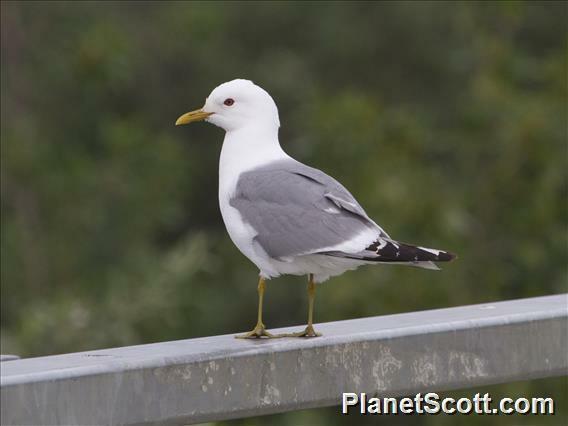 These gulls are relatively long-lived, with the maximum recorded life-span being 24 years (3). Gulls were dive-bombing us in the river. I think they were Mew Gulls.